The petroleum era has been short, fast and furious. Just 50 years ago, 80 per cent of the world’s commercial energy came from coal and a mere 16 per cent from oil and gas. 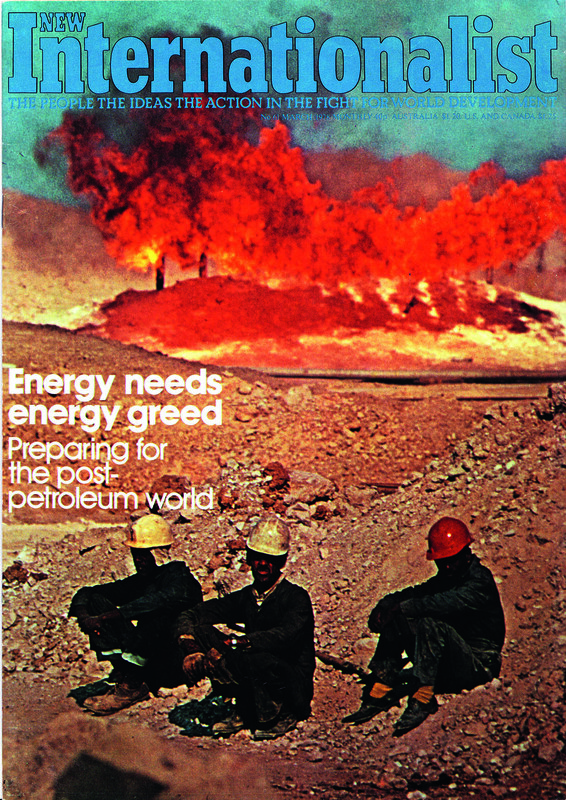 Today oil and gas comprise two-thirds of the world’s commercial energy budget. By 1990 production, even in the most plentiful fields, will have peaked and by 2020 the oil age will be dead. These facts are the bedrock of ‘the energy crisis’. Yet we are not running out of energy nor, if the laws of physics hold good, ever will. We are running out of cheap oil and gas. And this is the real crisis of the petroleum era’s most favoured children who grew up with fast motor cars and supersonic jets as their playthings, and came to regard limitless consumption of a finite resource not as a paradox but as their birthright. Undoubtedly, oil has changed the world. It has restructured cities and revolutionized travel. But who, in the end, does it benefit? Certainly not the one billion people around the globe who lack provision for even the most basic human needs. The only ‘benefits’ they have drawn are occasional rides hitched on crowded lorries and distant glimpses of jetliners zooming overhead. And neither, arguably, has much good come of it in the industrialized countries where the quality of life, as any harassed commuter will admit, is not improved by the rush-hour mentality that high-speed travel has brought. Though he may have every material comfort, what can be said for the spirit of the typical American male who devotes more than 1,600 hours a year to his motor car? He sits in it while it goes and while it stands idling. He parks it and searches for it. He earns the money to put down on it and pay the monthly instalments. He works to pay for petrol, tolls, insurances, taxes and parking tickets. He spends 4 of his 16 waking hours on the road or gathering his resources for it. And all this to travel in a year just 7,500 miles - less than five miles per hour. The poor of the Third World get the same average on Shanks’ pony. Surely the fact that the oil wells are at last running dry gives more cause for optimism than it does for gloom and doom? The opportunity is there, if we want to take it, to implement an energy strategy that won’t bypass the majority of the earth’s population or alienate the rest from simple joys. Such a strategy exists now. The technology is there. All the necessary resources are readily available, infinitely renewable and could easily be put on tap – the sun’s warmth, rushing wind, falling water, plant wastes. Yet solar heaters, windmills and biogas plants are still regarded in the developed countries as the province of a freaky fringe. While, in the Third World, few leaders are willing to encourage the switch to an energy-supply system that is so obviously regarded as ‘second rate’ in the West. Quite naturally, a mood of ‘what’s good enough for them is good enough for us’ prevails. This is where nuclear power comes into its own - an elaborate modern technology just waiting to be grabbed off the peg, and backed up by a sophisticated sales and maintenance team. Three decades of hard work, expensive research and development, and governmental acceptance have given it a gloss of respectability that is streets ahead of the competition. And the advocates of nuclear power do honestly think of themselves as the harbingers of an era of plenty for all the world’s people. This issue of the New Internationalist sets out to challenge that view and the assumptions inherent in it. At its heart the energy problem cannot be solved by technology alone. This is because, in the end, it is a people problem. If the petroleum era has taught us anything it is that the search for ingenious ways to pump society full of increasing doses of energy simply does nothing for human wellbeing or human equality. On the contrary, the need for economies of scale has led inexorably to the mass production of energy, to centralized facilities and centralized control. Nuclear reactors, which cannot be ‘local’ because they cannot be small, will only exacerbate this trend and therefore deepen the political and structural roots of poverty and injustice. The great myth which has to be banished is that energy sources and the technology that surrounds them are somehow neutral. They are not neutral. They are at once reflections of the society which designs them and powerful influences upon the shape and nature of that society. Some, like atomic fission, are necessarily centralized. Others – those based on renewable sources – are necessarily dispersed and lend themselves to the idiosyncrasies and endless variations of local decisions and local needs. Some will tend to diminish the gap between rich and poor; others will accentuate it. Some unavoidably dangerous sources can be permitted unchecked growth only under totalitarian regimes; others can lead to nothing more dangerous than a leaky roof. Some sources can be comprehended only by the world’s most elite technicians, others can be assembled in remote villages using local labour and indigenous materials. The real measure of development is the extent to which basic human needs are met. And surely, alongside the needs for food, clothing, housing, good health and education must be ranked the needs of individuals to control and direct their own lives freely? Nuclear power, by its very nature, must deny this fundamental right. Energy from renewable resources need not do so. Of course, the adoption of a renewable energy strategy cannot in itself abolish poverty and injustice. But the diversity and equitable availability of renewable resources, and the inherent gentleness of the technology that puts them on tap, can be catalyst for widespread political and social change. The increasingly conscious and vocal antagonism felt by communities for more centralized options – even if it is just dislike for particular refineries of particular reactors that have landed in their midst – is the first step on the road to just such a change. This article is from the March 1978 issue of New Internationalist.